The CCC (Car Connectivity Consortium) which includes Apple as its member announced the publication of new ‘digital key’ standard that allows drivers to actuate vehicle systems like door locks and the engine via an NFC-enabled iPhone. The technology is named the Digital Key Release 1.0, which plans to bring automotive manufacturers and mobile device makers together to create an interoperable digital key standard. The system operates in much the same way as first-party digital keys currently available from a handful of vehicle OEMs. 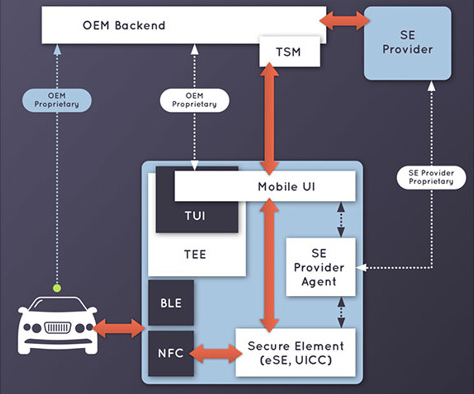 OEMs are responsible for proprietary interfaces between their respective backends and the car. The CCC is developing Digital Key Release 2.0 that will provide a standardized authentication protocol between the vehicle and a paired smart device, and will be fully with interoperability between difference smartphones and cars.